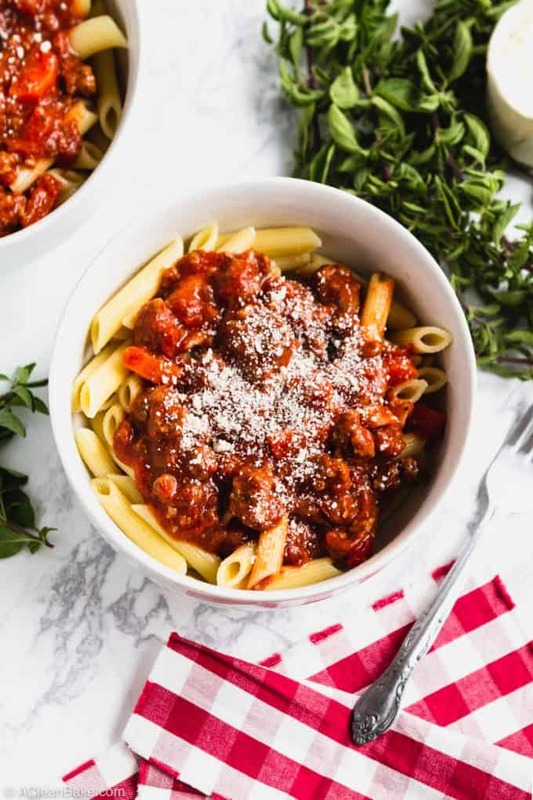 Bolognese sauce is a hearty and filling topping for gluten free pasta or veggie noodles, and now it’s easier than ever to make. 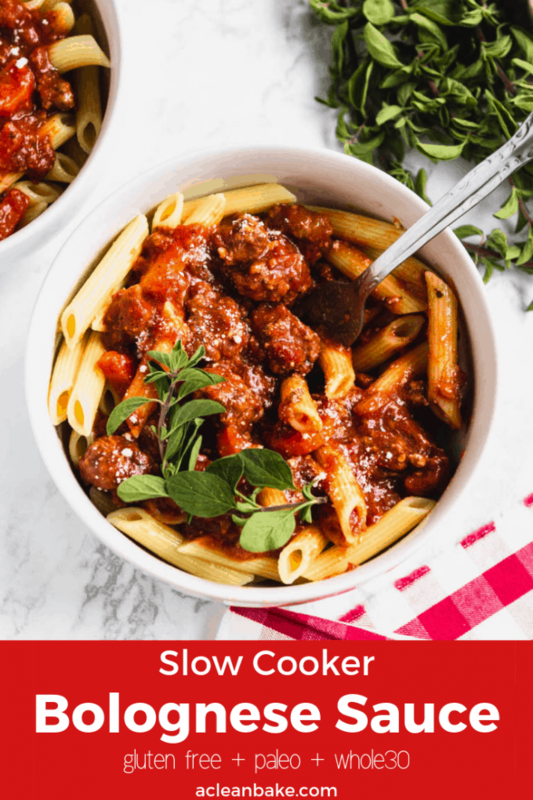 This simplified recipe is made in the slow cooker, with just 10 minutes or do of hands-on time. Plus, it is naturally gluten free, paleo, and Whole30 compliant! An ultra-moist, slow cooker meatball that I make in my house again and again, and that everyone else who has made them loves. Then someone asked a question: what if they didn’t want to roll the meatballs? It turns out that the word Bolognese may be Italian for “I was too tired to roll the d**n meatballs”. I say “may” because this has been neither confirmed nor denied by Italian scholars. But I’m pretty sure it’s true. If you are, like me, not a fan of touching raw meat, this is definitely the recipe for you. I mean, yes, of course, it’s more than that. Bolognese sauce is a meat sauce that hails from the Bolognese region of Italy, which is where Bologna is. Not BALONEY, the meat, but BUH-LOW-NYAH, a beautiful and historic university town in northern Italy. Italian tomato sauces vary slightly from region to region, and Bologna’s sauce is famous for the meal already cooked into the sauce. Maybe Bolognese cooks were too busy to roll the meatballs, too? 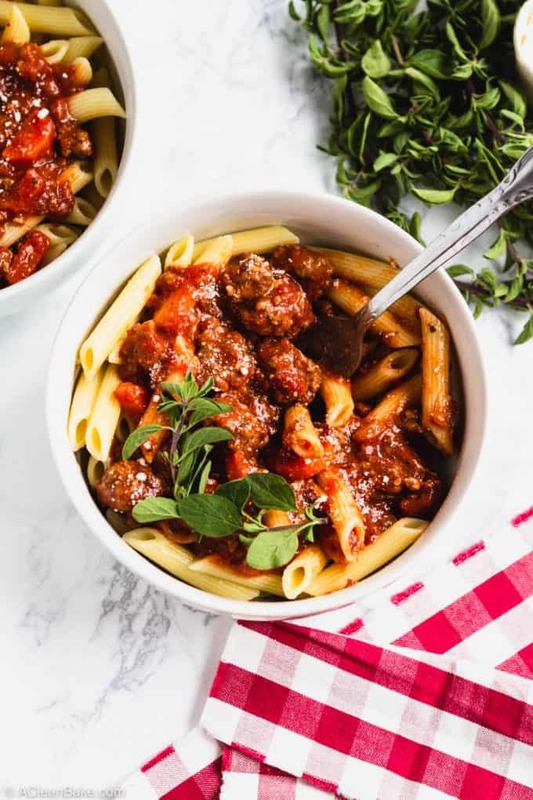 Bolognese sauce is a stovetop tomato sauce that cooks ground beef, crushed tomatoes, herbs, and spices into a succulent and warming sauce for your favorite noodle or zoodle. It’s the perfect dinner for chilly nights when you just want some healthy comfort food. You can think of it as a time-saving marinara sauce, with the meatball components cooked right into it. And we’re going to double down on the time savings by making it in the slow cooker! What do I need to make Bolognese sauce? 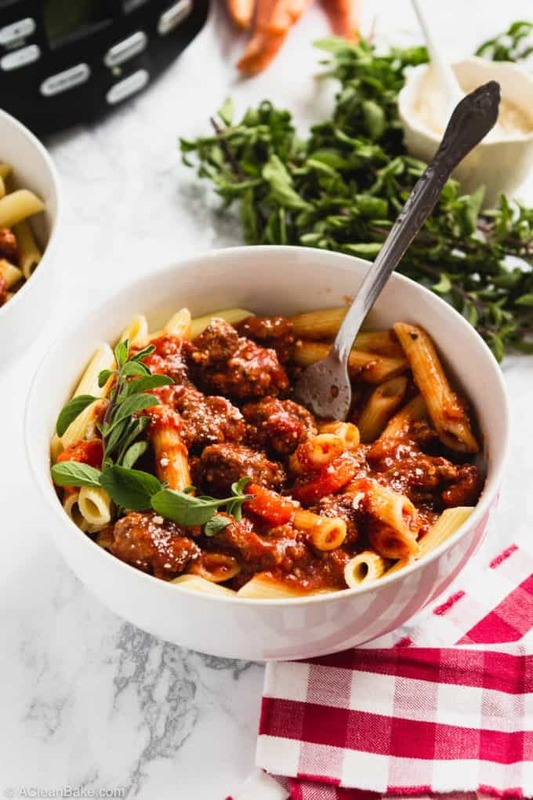 The thing to know about Italian food, especially home-cooked recipes, is that every family has their own slight variation, and every single family thinks theirs is the best. This goes for sauce, pasta, ravioli filling, cannoli, cucidati (fig bars), Easter bread… the list goes on. And that’s just the recipes that are a big deal in my own family. 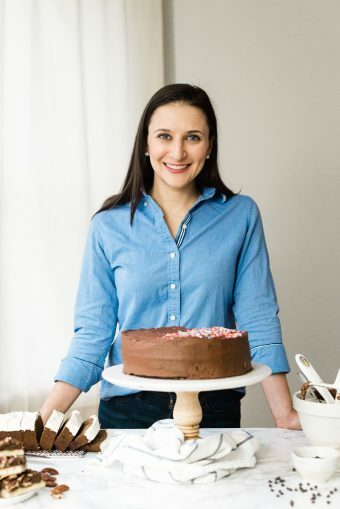 Even within my own family, we have dueling “best” recipes for some of these foods! So, I’m not going to pretend that there is one best way, or even one right way, to make Bolognese sauce. I will tell you, however, that I’ve simplified the traditional recipe down to the basics that you’ll need to make the sauce really, really delicious. Meat: The most authentic way to make bolognese sauce is using ground beef. Most recipes call for lean ground beef. I used my ButcherBox ground beef, which I think has a slightly higher fat content. A few variations on the recipe call for half beef, half pork, or Italian sausage, out of the casing. I also make this something with ground turkey, although admittedly, that’s not very authentic. Tomatoes: Some recipes start with whole tomatoes and cook them down. Others blanch, peel, and chop fresh tomatoes to use in their sauce. Still others mix in tomato paste. I use one 28 ounce can of crushed (or chopped, for more texture) tomatoes and call it a day. Aromatics: Yellow onions, garlic, and carrots (and often, celery, which I did not include in my version), round out the flavor of this sauce. You can use whole garlic cloves, but I prefer granulated garlic, which is easier to use and store. Herbs and spices: Fine sea salt (or you can use kosher salt), black pepper, and a pinch of red pepper flakes are all that is necessary to make the flavor really sing. Of course, you can reduce or omit the red pepper flakes if you’re sensitive to heat. You can throw in a bay leaf or two, too, if you want (which many recipes call for). Personally I don’t think it’s necessary, since it adds minimal flavor and requires a whole other ingredient that you may not have on hand already. You can also add a 1/4 teaspoon ground nutmeg, a traditional flavor in Bolognese. I’ve left it as optional. A little acid: This is also optional. Most tomato-based sauces use a generous splash of red wine to balance the aggressive sweetness of all those tomatoes. 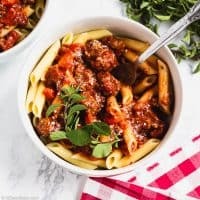 In my 30-minute marinara and my favorite slow cooker meatballs I use balsamic vinegar to provide the necessary acid, both to make it Whole30 and to prevent you from having to open an entire new bottle of wine just to use a splash (unless you want to drink it with the meal, which wouldn’t be a bad idea!). In this recipe, I’ve left it out completely to simplify the recipe, and you won’t miss it. You’ll start with your aromatics. First, preheat the olive oil, and cook down your onion over medium heat. If you have a multi-cooker that has a sauté function (this is the one I use), you can do this in the machine and switch it to slow cook when you get to that step; otherwise just sauté it all in a large skillet or dutch oven. Add the meat, breaking it up into bite-sized chunks. I leave some larger chunks, since that’s what my son prefers. Cook until the meat is about halfway done – browned on the outsides but you can still see a lot of pink. Then, all you have to do is transfer the meat and onions to the slow cooker (if it’s not already there), add the remaining ingredients, cover, and let the machine do the rest of the work! What if I don’t have a slow cooker? You can make this in a Dutch oven. Just follow the instructions but cover and cook on the stovetop over low heat until the meat is cooked through. Can I use the Instant Pot instead? I don’t know exactly how to make it in an Instant Pot, but I imagine it is possible. Start with 12-15 minutes cook time at high pressure (natural release). Can I use ground turkey instead of ground beef? Yes. If you would like to use ground turkey instead, I recommend cooking on 3-4 hours on low heat, instead of 2 hours on high, as the recipe specifies for beef. 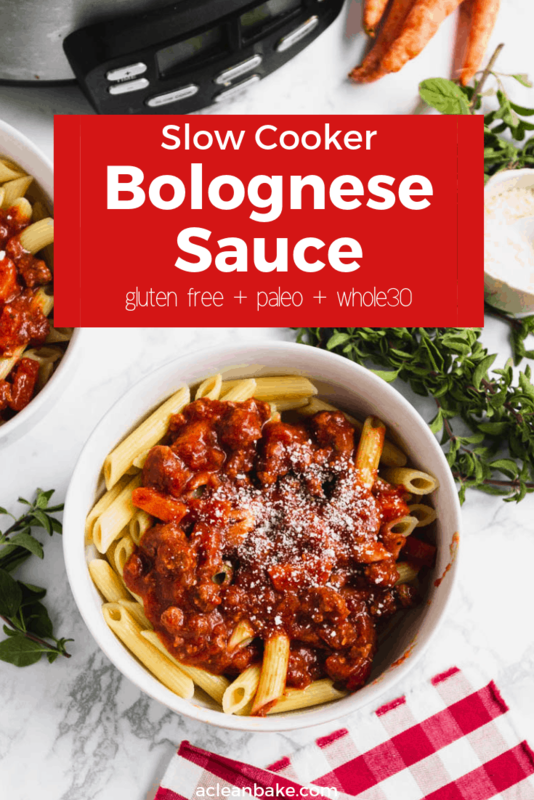 Does this slow cooker bolognese recipe taste like the one at my favorite Italian restaurant? Well, I haven’t tried it, so I can’t say. If you’re asking if this is a perfect, Marcella Hazen-worthy bolognese, probably not. 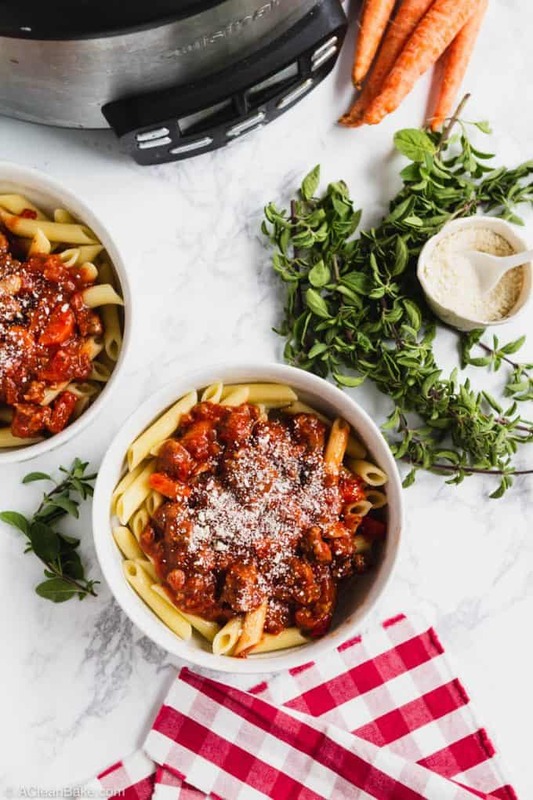 This is a normal-person-with-a-busy-schedule Bolognese recipe, but even though it’s meant to be a time-saving, easy recipe, it’s still a darn good sauce. How should I serve this? Bolognese is traditionally a spaghetti sauce, served over noodles. The tomato sauce seeps through the noodles and the meat stays on a pile on top. It’s pretty delicious. 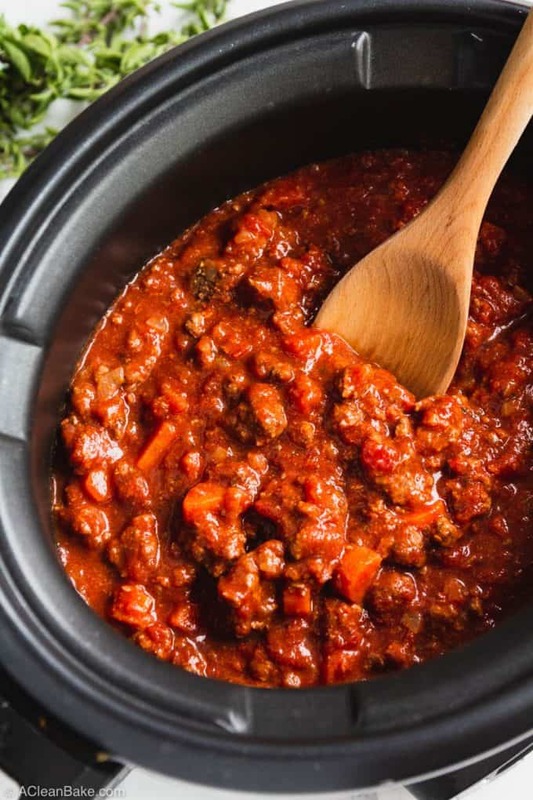 You can go the traditional route of heaping this Bolognese sauce over a pile of your favorite (gluten free) pasta, or you can go with polenta, cauliflower or parsnip mash, zoodles (zucchini or other veggie noodle), or even roasted vegetables. The possibilities are endless! Can I make it low carb or keto? On its own, I believe it is keto-friendly. To make it a full meal, serve over cauliflower mash, and top with parmesan cheese for a little extra fat. « Paleo vs Keto: What’s the Difference?